Quick Pasta Recipes, 50 Fast Pasta Veg Recipes. Pasta has become so popular that it has become part of the monthly grocery purchase list in most Indian households! And well, it is a handy ingredient to have in your kitchen, because with a little planning, you can put together an exotic pasta-based lunch or dinner even on the busiest of days. You can make your vegetarian pasta recipes with white sauce, green sauce or red sauce – and all these are simple and easy. You can whip up a luscious and rich white sauce based pasta dish like the Cheesy Penne Pasta or Pasta in White Sauce within minutes. Mac and Cheese is an international favorite, which features boiled macaroni in a gooey cheese sauce, baked with a topping of bread crumbs and cheese. Macaroni in a Hurry is one of our favorites amongst the many fast pasta dishes, while Pesto Macaroni is an exotic choice. You just need to blend together the pesto ingredients and cook it with the macaroni – awesomely simple! If you are looking for recipes including herbs and vegetables then this Herbed Fusilli in Pink Sauce is a pretty sight, burgeoning with flavors and textures. You will also be pleasantly surprised to know that famous dishes like Pasta in Tomato Sauce and Penne Arabiata are actually so simple that you do not need to go to a restaurant to have them! Another delightful dish made with richly flavored tomato sauce is Red sauce pasta. Garlic Spaghetti tossed in an oil-butter sauce with a splash of herbs and chilli flakes gives it a pleasant flavour. Basil Corn Fusilli is an easy pasta recipe made using a handful of ingredients like fresh basil, parsley, garlic . If you want a pasta dinner then this Olive and Tomato Pasta which takes just 30 minutes to cook is a treat that pampers the taste buds but, if you are looking for a quick and easy recipe then this Macaroni Cheese wouldn’t take more than 20 minutes. Give your authentic Italian pasta, an Indian twist and cook this pasta bake Pav Bhaji. Also, if you are looking for a healthy twist to your Italian classics then this Whole Wheat Spaghetti with Vegetables in Almond Sauce is what you should be cooking next. Pasta is a versatile ingredient. You can use them to make delicious stuffing, fried snacks or a salad. Primavera pasta salad with a creamy curd dressing is vibrant and sumptuous. Peek into this section, and you will be in for many such happy surprises. 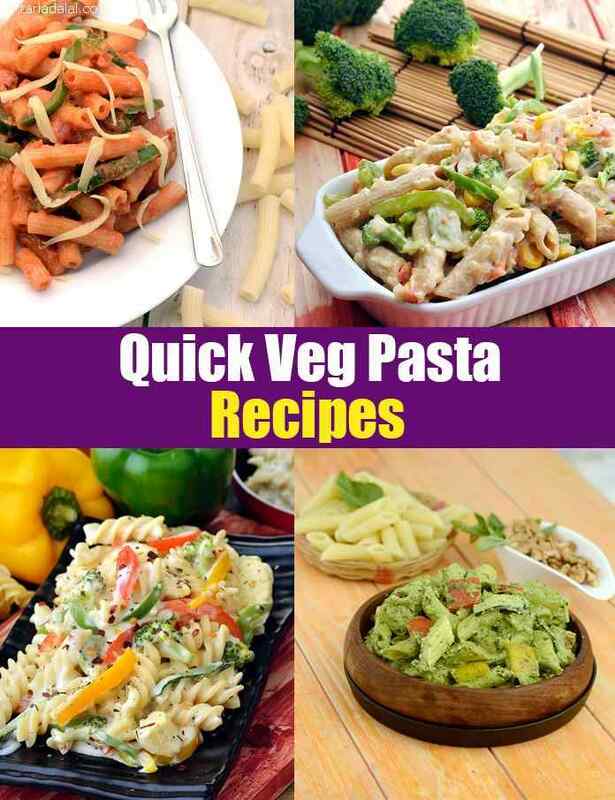 Enjoy our Quick Pasta Recipes, 50 Fast Pasta Veg Recipes and other quick recipe articles below.